If I was told that I could only use one beauty brand for the rest of my life, I would choose Guerlain without hesitation. From my favourite perfume to their stunning cosmetics and effective skincare, Guerlain epitomises luxury beauty at its finest. Discovering Beauty Blogger recently asked me for night cream recommendations and one of my favourites is Guerlain's Midnight Secret Late Night Recovery Treatment. As the name suggests, it's something of a must-have for today's busy women, whether you're putting in the hours at the office, a party girl or a new mum. Famously loved by supermodels such as Sophie Dahl, it's my personal go-to night cream when I know I'm not going to get much sleep but still want to wake up looking fresh faced. There's something about the satisfyingly weighty gold and blue bottle that harks back to a more glamourous era and this is reiterated when it comes to applying the wonder cream. As I expect from a luxury product, it's well thought through with a functional pump dispenser and sufficiently transparent packaging that you can see how much is remaining. Unlike many night creams, Midnight Secret Late Night Recovery Treatment has a lightweight formula which is easily absorbed. Skin is left feeling velvety. One of my favourite things about Guerlain products is the fabulous scents and this doesn't disappoint, with a delicate floral fragrance. 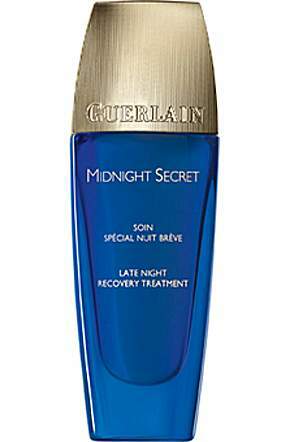 Guerlain Midnight Secret Late Night Recovery Treatment isn't going to work miracles 100%. If your partying could rival Pete Doherty's then sooner or later it's going to be reflected in your appearance. However, I feel that Midnight Secret Late Night Recovery Treatment delivers on its promises and this (and perhaps a dab of YSL Touche Eclat) will certainly help to disguise the telltale signs of one too many late nights. Now, at £62.50 for 30ml, noone can deny that this is a pricey product but a bottle will last you for a considerable amount of time as you need to remember that it's not intended to be used every night. What's more, it feels so luxurious that it really is a treat to use, a little goes a long way and most importantly, it delivers. Everyone should try this.